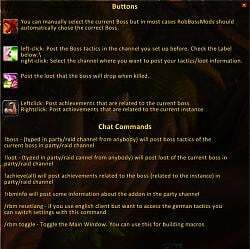 Just Copy the "RobBossMods" Folder to your Addons folder and the addon is loaded. 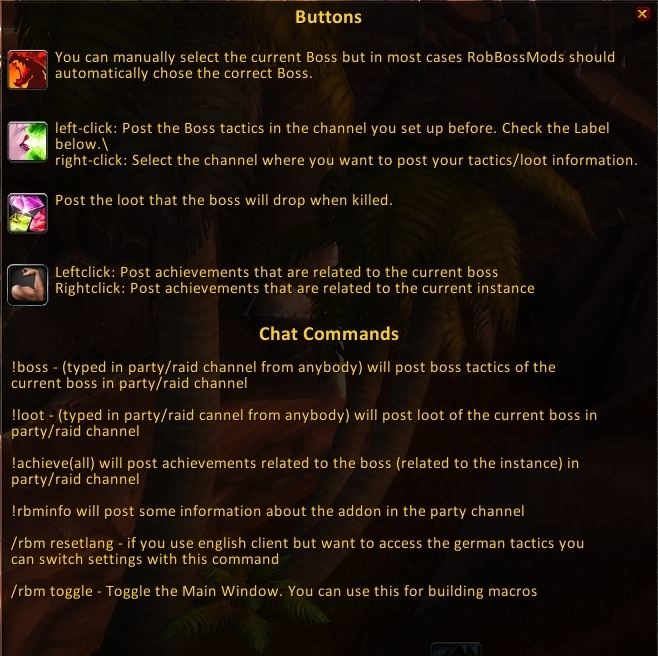 Left-Click on the Minimap Icon/ Titan Panel also toggles the RobBossMods Window and you can send the tactics for the current chosen boss to either Party/Raid,Yourself,Officer or Guild. Right-Click on the Icon/TP and you will go the setting section. Furthermore there is the possibility to edit the pre-made tactics for each boss. 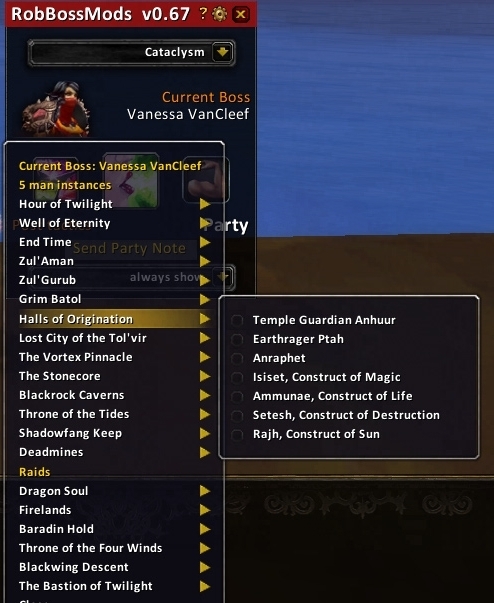 Especially the raid tactics - which i did NOT deliver with this addon (because i think you need some kind of voice communication for raids ) - can be edited and then used in your random raids. Mit Cataclysm sind viele neue Instanzen mit Schwierigkeitsgrad "Heroisch" erschienen. VIele sind gezwungen sich mit dem LFG Tools und Randomgruppen herumzuschlagen. Das Problem: Einige der Randoms kennen die Taktik nicht oder nur unzureichend und sind verunsichert. Mit RBM kann sich das ändern. RBM erklärt schnell und auf Anfrage den Boss, den man vor sich hat. Einfach RBM in den Interfaces\Addon Ordner packen und das Addon ist geladen. 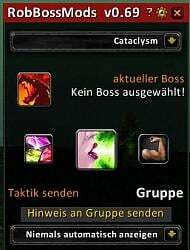 Werdet ihr eine eine Instanz befördert ( durch Dungeon Browser ) wird der erste Boss der Instanz automatisch geladen. Mit Linksklick auf das Minimapsymbol kann man das RobBossMods Fenster öffnen. Mit Rechtsklick öffnet man die Einstellungen. Im RobBossMods Fenster könnt ihr Bosse manuell auswählen. Ihr könnt dort auch die taktiken der Bosse an diverse Kanäle senden. Wenn ihr in einer Instanz seid und ihr visiert einen Boss an, wird der als aktuell geladen. Stirbt der Boss dann, wird der nächste automatisch geladen und so weiter. Kommt ihr in eine Instanz, in der bereits Bosse tot sind, so wird automatisch der aktuelle Boss geladen. Weiterhin habt ihr die Möglichkeit unter Optionen die Taktiken zu editieren, falls ihr der Meinung seid, dass einige Taktiken falsch oder zu oberflächlich formuliert sind. Insbesondere für Raids habe ich KEINE Taktiken mitgeliefert, da ich persönlich der Meinung bin, dass man im Raid sowieso im TS sein sollte, um so bessere Absprachen zu treffen. - please report further crasehd asap! - if you are in a manual party and at the same time in an instance group (e.g. you do PUGs with you friend) you will post the tactics to the instance chat. so please report if you detect something strange. because blizzard decided to completely change some spelll IDs, some tactics are broken. if they are broken you will see the old spell id without link. i will fix that issue later because i am very busy with private stuff at the moment. - !!! added english tactics for all MoP 5 man heroics !!! - finally: Edge of Madness Eventbosses are implemented !! - Russian translation for new menus and ZA / ZG tactics included now!! - HOTFIX: There were issues that certain tactics were broken because of wrong line breakes ( line breakes destroyed the spell-links). that should be fixed now! - Changed the instance detection. Now the first boss ( or better the first boss available ) will be chosen as current boss automaticly in EVERY Instance. - Minimap Icon should now stay where you last draged it to. - Raid instances added. Tactics are empty! Please edit the tactics ingame ( interace options -> RobBossMods ) and send me the WoWOrdner\SavedVariables\RobBossMods.lua File so i can add default raid tactics. Isiset and setesh tactics are mixed up. Will fix that in 0.25 or 0.26! - PLEASE try it and post your experience bugs and everything here! - completly sepereated addon from text. find ich gut, dass das addon immer noch leute begeistert, es wurde für cataclysm gemacht, als die 5er noch extrem knackig war ^^. Danke für das erstklassige AddOn!! 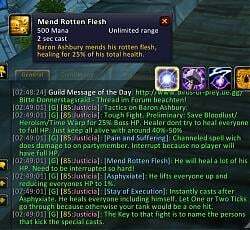 Great addon lol! Especially when ur playing with ppl who's just started to play! Would be nice if you can fix this. Hi! I noticed that achievements are only posted in groupchat when you are in a raidgroup. Not everyone can see them, only your current group. i will take a look at that behaviour for it should be already fixed.. thanks for reporting this bug. could you specify for what instance/boss the button achievements does not work? is it random or for certain instances? it may be that there is no achievement related to a certain boss, it'll just show nothing then. Last edited by cremetorte : 09-04-12 at 10:25 AM. I dont have an active wow account at the moment. but when MOP comes out all that bugs will be fixed. -There are these great dynamic messages on some bosses, but it would be really nice if the user were able to edit these as well, or even add new ones to old bosses without messing around with the .lua files. -How about providing suggestions on how to do Boss/Dungeon achievements in the tactics to encourage people to try it more often in random grps? Lots of people say that achievements are impossible on random groups, but that's not true. Great addon anyways, hope to see it again in MoP! EDIT: Another great feature I just thought of would be explanations for the more difficult "non-boss situations" in dungeons, sort of like the gauntlet run before the Echo of Tyrande in End Time or how the cauldrons should be used in the various situations in Zul'Gurub, so it can be easily relayed to players who are new to the instance. Last edited by Estelyen : 07-17-12 at 03:34 AM. but when MOP comes out all that bugs will be fixed..
Prob already been asked, but cant find it anywere....are you going to add raid boss strats? Same question.... with the new LFR, it is necessary! thanks. 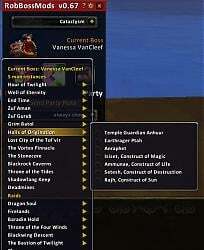 Two saved settings issues with v0.62 in WoW 4.3 live. First, in the main RobBossMods frame, instead of the default "Party/Raid", select another checkbox. Such as "myself". Log off and back on, the next time you open the frame the checkbox has changed back to the default Party/Raid. It doesn't retain the checkbox you changed from the default. Happens all the time on every relog and is quite inconvenient. Second setting that isn't saved--under more limited circumstances--is the minimap button position. If you relog/restart with RobBossMods constantly active, no problems. But...if you turn off RobBossMods, relog, then turn it back on for the next relog, the minimap button resets to its default position. This usage is typical if, say, you use ACP or similar to load different mod sets for dungeons & raids and so on. Also quite inconvenient as that minimap button overlaps the Blizzard dungeon finder icon in its default position. set here, but the mod ignores it under the above circumstances. There also doesn't seem to be a setting in the SV file to remember the checkbox you set other than "Party/Raid" in the main frame. EDIT: further testing, yes there are problems with the minimap button even not disabling the mod. Relog the same character with RobBossMods active, it remains where you set it. But log off, log onto a different character that doesn't have the mod active, then log back to the first character, it resets to the default position. Recommendation: add a LibDataBroker feed (for displays that tons of people use) & an optional minimap button using LibDBIcon-1.0. Won't have any problems afterwards if done correctly. Or if you really don't want to add a LDB feed, just use that library to create the minimap button instead of how you are currently doing it. Last edited by Zidomo : 12-13-11 at 05:04 PM. Will there be an update for 4.3? Hello, I am interested in this addon and have noticed quite a few grammar and spelling issues in the English version. I would be happy to fix grammar issues with the English version and provide future updates for it if you would like. If you are interested please send me a private message so we can get in touch. today i contacted the main distributer of LibBabble and they finally created the jin'do key and i translated and now the release version includes all the bosses i need. Building this addon consumes a lot of time. Because i am only one person and normally i study, i use time which i could use making real money.